I work in the field of college readiness. Currently, I’m the Project Director of a large GEAR UP grant under the auspices of The University of Texas at Austin. Last week, we conducted our first training for the school-based site Coordinators. The training was mostly intended to familiarize everyone with the goals and objectives of the project and equip them with tools and resources they would need to do a better job. In developing these tools and resources, we borrowed heavily from other grants since GEAR UP has been around for nearly 20 years and people have gotten better at implementing the grant. However, I also wanted to include certain intangible aspects in doing our job that I often feel are neglected in the GEAR UP community. I included the following five concepts that I consider paramount and underline the very essence of GEAR UP. Each one of these topics can be weeks worth of time in any graduate school class but I had 10-15 minutes to cover all five. But something was better than nothing and my goal was simply to introduce these topics so people think about them. 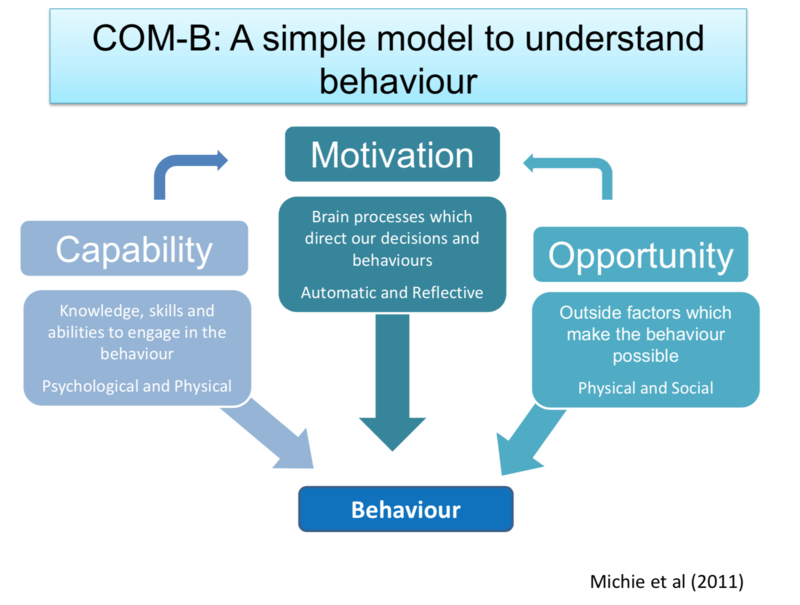 I used the COM-B Model that highlights Capability, Motivation, and Opportunity as three primary factors in understanding why people do or do not do certain things expected of them. Capability is the characteristic whether people have the necessary skills to do the thing expected of them. Motivation is whether they want to do the thing expected of them, and finally, Opportunity is whether they have a chance to do the thing expected of them. In terms of college readiness, we expect students to take AP courses in high school as part of increasing their academic rigor but do we stop and ask whether all students have the opportunity to access these resources especially if the school they’re enrolled in do not offer AP courses? Recent research by Carol Dweck et al. has looked at why some people fail and some succeed given the same circumstances. It turns out it has something to do with your mindset. This is not some ‘believe in yourself’ stuff you get in self-help books but has been scientifically proven. But the important part in college access is whether people can or rather can we help change people’s mindset or are, as most assume, that some kids are born smart and some are not. But it turns out you can. In terms of schools, what we say or do profoundly affects the way students behave. Just in terms of an activity in which they fail, if you praise their effort instead of intelligence, the students are more likely to succeed the next time. Gradually, this affects their academic performance. We concluded this section by having the trainees take a quiz to assess the state of their mindset. 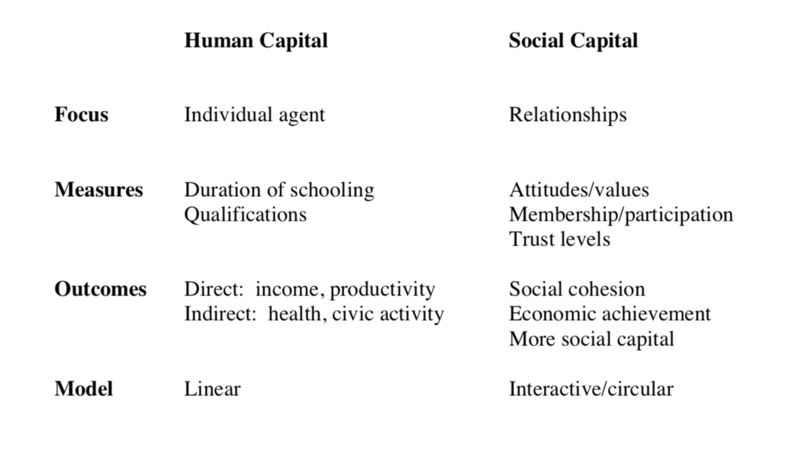 Continuing on the reasons why people succeed and now taking a step back in the theoretical understanding, we delved into the definitions of human and social capital and how it affects outcomes in life. We all are influenced by both these factors and by some more than others. I offered the example of a son of a rich banker who is more likely to get a job on Wall Street thanks to his dad’s social and professional connections. Of course, he may be smart but getting that extra help makes a big difference especially compared to an equally smart person whose parents never went to college. In our work, we often deal with the latter populations. The smart strategy is to focus on building the human capital as much as possible and gradually building the social capital in the background for future generations. Equality aims to ensure that everyone gets the same things in order to enjoy full, healthy lives. What’s wrong with that, right? Sounds great even. But let’s look at Equity. 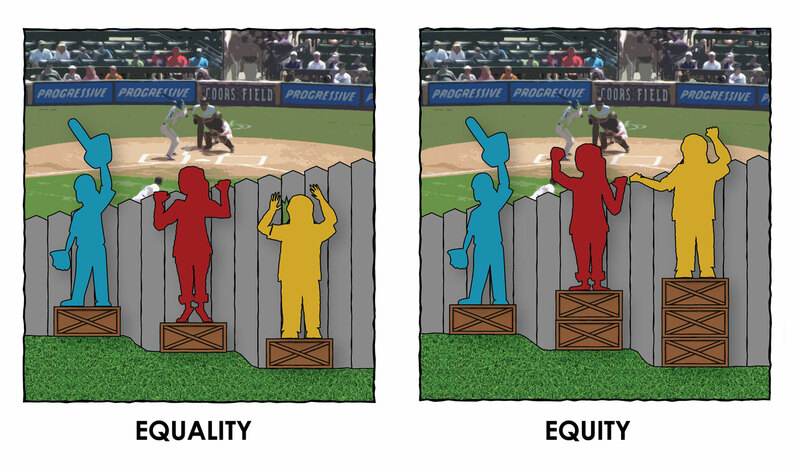 Equity involves trying to understand and give people what they need to enjoy full, healthy lives. Both concepts aim to promote fairness and justice but only Equality assumes everyone starts from the same place and needs the same things. We know from our life experience and from the previous point of social capital that this isn’t even remotely true. Hence the popular and widely successful Pre-K social program is called Head Start because it aims to give the disadvantaged children exactly that so that they’re not left behind later in life. Since GEAR UP is a cohort model within high-need school districts, the need for equity-based action is even more acute We simply need to provide additional resources to get these students on par with their counterparts in ‘rich’ districts so that they have a shot at achieving similar outcomes. Finally, I ended with a thorny issue of implicit bias. I was introduced to this concept formally when I heard a story on NPR and later attended a session at AERA by the same author who studied this issue with kindergarten teachers. The results are profound and shocking. Going back to our AP courses example, The National Association for College Admission Counseling found that grades in college preparatory courses were the top factor that colleges considered in the admission decision. However, four out of five African American graduates were either left out of an AP subject for which they had potential or attended a school that did not offer the subject.Our preconceived notions often dictate our actions especially if we are completely oblivious to its presence.